Do we know whether Frank Lloyd Wright used and favored Blackwing 602 pencils? I’m asking in case any readers might be able to point me toward some documentation. It has been asserted so often that I thought references had to be plentiful. And without some commentary from the man himself, a picture wouldn’t really be enough to indicate the Blackwing was his favored pencil, as it’s been asserted. Quotations by and about Stephen Sondheim, John Steinbeck, Nelson Riddle, and Chuck Jones abound in biographies and interviews, but I have yet to come across any citations (online) attributed to either F.L.W. himself, his associates, or his students attesting to his use and favoring of Blackwing pencils. I’m not suggesting he didn’t use and favor Blackwing pencils; perhaps I’ve just been looking in the wrong places. Before I add him to the list of Blackwing users I’d like to find some (or any) supporting evidence. Building a list of prominent Blackwing 602 users makes an already colorful story much richer, and I think that the respective legacies involved deserve some respect, care, and attention to detail. So if anyone has a lead (or some lead) on Frank Lloyd Wright—mind you, advertisements don’t count—please leave a comment; any help will be appreciated. The F.L.W. page has recently been taken down, but there hasn’t been any official statement from the company that makes the pencils. Perhaps it’s too late to try—so much time has passed since this idea was raised that it will be difficult to convince consumers how it happened and why it persisted. Perhaps it’s wishful thinking it will all disappear. 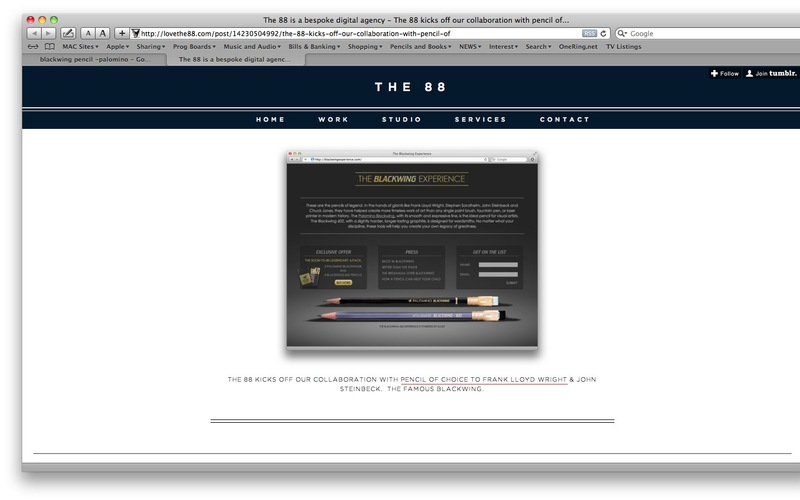 I think this is an unfortunate (but a prime) example of how the history, legacy, and ‘name’ of the Blackwing 602 are being ignored, abused, and exploited amidst its so-called “revival”. It’s been more than 2 years since the first attempt to copy it—2 years—and there’s been almost no effort to acknowledge the culture surrounding the history and the popularity of the Blackwing except what you would read in an advertisement (and, even some of the advertisements haven’t been accurate). 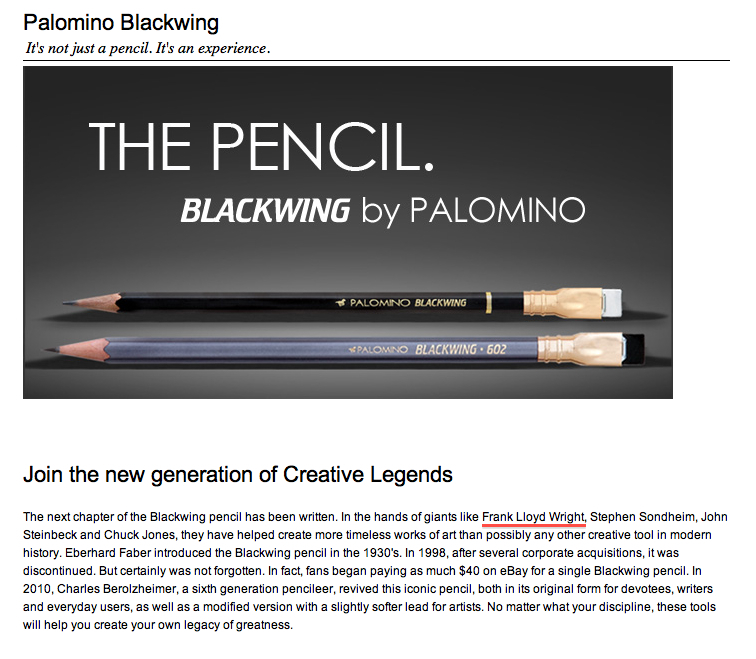 You see a statement such as “…maker of the famous Blackwing” (seen here) and at some point, it’s no longer just hubris or slight-of-hand: they aren’t the maker of the ‘famous’ Blackwing—they make a lookalike called the “Blackwing”. Sure, semantics can be argued for or against, but engaging in such isn’t meant to clarify, rather it’s a device to distract attention from the original intent: to assume and obscure. Yes, mine is a particularist point of view, perhaps even quixotic (though there may be some Moleskine devotees who can empathize). But ironically, I’m not at all against this company or it making money—in fact, they make some other pencils that I like very much. Last, it’s certainly nothing personal. It’s just the clumsy, dishonest, and historically-disingenuous manner in which this “revival” all unfolded, continues to do so, and which all seems unnecessary. It’s disappointing that accuracy and detail have been low on the priority list all this time—especially, for example, when you broadcast to the entire world in an advertisement that a relationship existed between Frank Lloyd Wright and one’s product (notwithstanding that this product isn’t actually what he used, even if he had used them, which it turns out, he didn’t). Never mind the Blackwing, what does that say about respect for Wright, his work, and his legacy? What does it say about respect for the consumer, or about respect in general? The world won’t end because Wright’s name was misappropriated for a factually-impoverished advertising campaign for a pencil. It’s part of a pattern though, and a symptom. A disappointing and troubling symptom. 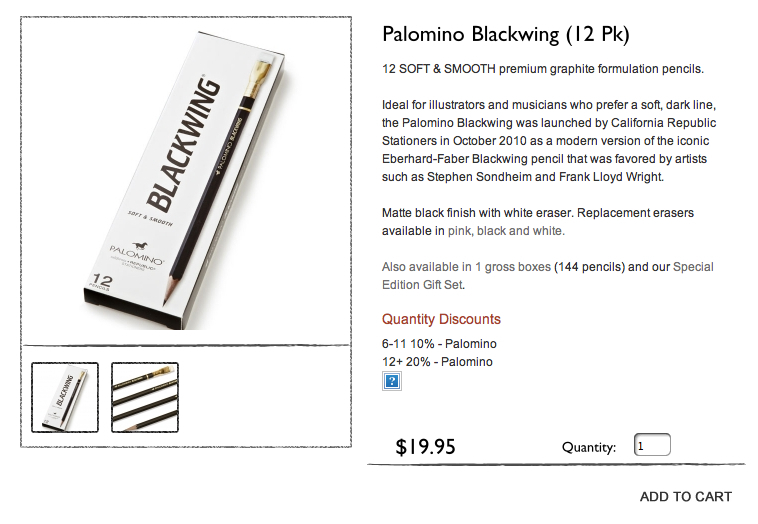 I’m just sorry it’s the Blackwing that has to pay for it. Thanks, Gunther. Michael Leddy’s finding of the Copland picture was quite incredible, as was his generosity for sending it my way. Perhaps someone may come across a photo of F.L.W. Thanks for bringing this issue to our attention. Please understand that there has been no intentional effort to mislead anyone about who are or are not famous users of the original EF Blackwing pencils. I think your idea of working to do a more comprehensive and accurate catalog of the historical users is a good one and I support it. I personally own the print you have shown of the pencils that were found on FLW’s desk at the time of his death and it hangs on my wall in my office. We have posted in the past on our Pencils.com blog about FLW as a famous pencil user in our efforts to promote pencils in general and connect them with famous creative people. It appears the genesis of this as yet unsubstantiated claim was a post last Spring where a staff member did a short Blackwing Biography Series of famous users timed around the launch of our 602 model. He erroneously expanded this to indicate that FLW was a Blackwing user. I simply assumed he had done his research on this before posting that and didn’t think much further at the time. Unfortunately, it now appears this information was again in the recent Klout perk campaign this uncertain information has been repeated both in the website reference (now corrected) and in my personal note to the Klout 602. Much harder to correct, but we’re making an effort here and will be bringing this to their attention to do our best on this. Sorry for any confusion this may raise. In the meantime, in doing some further background checking on this matter we have had feedback from a relative of an architect from the FLW era that the Blackwing was a commonly used pencil among architects. That source is also working to see what can be learned further about FLW in particular. I understand your skepticism here. While we’ve invoked the creative tradition of some people we know (or apparently in this case thought we knew) were Blackwing users, we would never intentionally misstate the truth. I’ve tried to be careful where I’ve had any question myself about such claims and correct the situaiton when and if I learn of something we’ve put out is innacurate. 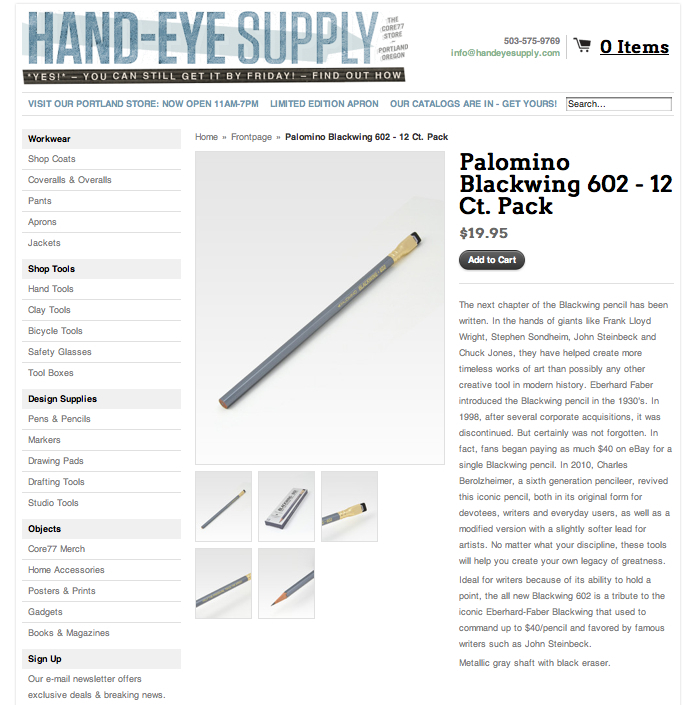 Frankly, we are much more focused today on creating a new generation of famous Palomino Blackwing and Blackwing 602 users and promoting those people and their current creativity, while harkening to the tradition of original users. Fortunately we’re having some success here. And finally, congratulations on the Duke Ellington photo find. Very nice indeed. Thank you for your post and for your candor. First, let’s be clear — I didn’t bring anything to you. This blog doesn’t fall under the umbrella of pencils.com or its public relations. Second, the “support” you’ve offered for my efforts to accurately catalog historical Blackwing users is unsolicited, and a bit presumptuous. It reminds of politicians who lend their “support” to some project, hoping to engender a sense of propinquity with it and the people who are behind it. In essence: we’re not in this together. My interest lies in the rich and colorful history of the Blackwing, because its story—and those of the well-known people who used them—can seemingly stand-in for anyone who likes any other pencil for every other reason just as much. The 602 is like a kind of catch-all for anyone who likes pencils; from the most passionate collector, to the boy or girl who would “just like to try one.” This blog has no financial or commercial value. Your interest in this pencil’s users and its history lies in exploiting them. To sell your product. “Reviving” (as you call it) this pencil had nothing to do with preserving or documenting its history, it’s to make money. There’s nothing wrong with money, though. You mentioned that you are “sorry for any confusion” regarding Frank Lloyd Wright. I’m not confused about whether F.L.W. used Blackwings. Not at all. Simple searching bore that out. But I am confused as to why you use the euphemism “uncertain information” instead of something more accurate like “mistake”. I’m confused about how the owner of a company—who has no pause invoking such a lofty name for use in his own advertising—doesn’t do the vetting. I’m confused as to why you use the names of incomparably gifted people who either used (or might have used) or worked with someone else who used (or might have used), Blackwing pencils, in advertisements and blogs about your pencils——pencils that those very people have never actually used. I’m confused about how you can seemingly respect the work and legacy of Frank Lloyd Wright so little that you would just paste his name in your advertisements but not personally care enough to gather the facts. Do you really know who that man is? I’m confused as to how piggy-backing off of someone else’s work is more satisfying than standing on your own work, especially when you have such great work to stand on (i.e. the Palomino brand). I’m not some self-appointed guardian of the Eberhard Faber Blackwing’s history or legacy. I’m just a guy who has an interest in pencils, and for this blog I focused on the Blackwing because I was interested in learning more about it. Combined with the help of friends, fellow-bloggers, and readers, The Blackwing Pages has become a small, reliable (and hopefully entertaining) source of information about the Blackwing. It’s something that we’re all proud of. Charles, I’ll finish by saying that at the end of the day, it’s really none of my business. I have no experience in running a pencil company, I have no idea about the kinds of challenges you’ve faced in making these pencils, and even if I did, it’s still none of my business. But I’m not really talking about your business here. It’s all of this diffusion and delusion about the Blackwing that is being spread in the name of a buck; that’s what is so troubling. And that’s partly why I maintain this blog — one small spot online where people can read about the Blackwing’s story, so that it isn’t lost or overwritten like so many others.